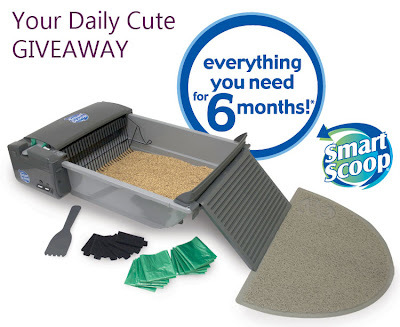 Your Daily Cute: Giveaway: SmartScoop Self-Scooping Litter Box! We have an exciting giveaway today, Cuteheads! If you're tired of being a slave to the poop scoop, then you'll definitely want to enter! We're giving away one SmartScoop Self-Scooping Litter Box (valued at $149.99) to one lucky reader! An automatic litter box sounds like a dream, doesn't it? Well, Cute can make your dreams come true! It’s time to upgrade to a smarter, fresher litter box! The clumps are deposited into a covered bin where the Activated Carbon Filter absorbs and eliminates odor. For clean up, just empty the No-Touch Waste Bag from the waste bin, tie it and toss it. Based on a single cat household, bags are often changed about once a week and filters are changed once a month. The SmartScoop Self-Scooping Litter Box is $149.99 value and comes with everything you need for 6 months (over a $40 value! ): 24 No-Touch Waste Bags, 6 Activated Carbon Filters and a Litter Catching Ramp and Mat. 1. Leave a comment below and tell us how many times a day you have to scoop the litter box. 4. Subscribe to Cute by email (up there on the very top left) and tell us you did! So, basically, everyone can leave up to 4 comments for 4 entries! If you are already following or "like" or subscribed by email, leave a comment to say you are and that counts, too! All entries must be received by midnight EST, Tuesday July 19. I'll pick a random winner on Wednesday and make the big announcement soon after! U.S. shipping only. Good luck! P.S. Don't forget it's Two Cats Tuesday, too, so don't forget to go visit Pimp and Moo on their post! I don't have to scoop everyday. We have enough litter boxes so they don't get dirty enough to warrant a scoopin' everyday. I subscribed to your e-mail campaign. I have several cats and I scoop three times per day. Great Giveaway! I am subscribed to your site, following on Twitter and Like on Facebook. Scooping once a day because kitties have access to a protected outside yard and they really like using it. Rainy days? Scooping twice a day. I liked you on facebook with 11 cats, I scooped lots of litter boxes a day, would be nice for 1to practicably take care of itself. Love to win it. I scoop only once a day, but it's in the basement and those steps can be a pain! I have 2 litter boxes that I scoop twice per day. I've never seen this device, and I'm wondering if my scaredy-cats would use it? They are so leery of strange things that make noise. 2 indoor cats that really know how to decorate a box. Scoop 3 time a day. Wouldn't that box be wonderful? I scoop four boxes once a day for our six cats. I subscribed to Cute by email. Scooping three times a day for nine cats, four litter boxes. Of all the things I'd love to do, there are few I WOULDN'T care to do anymore, one is scoop litter three times a day. and I'm an email subscriber. I guess I am the lucky one. I only have to scoop once a day and I have 2 boys, BUT when my foster is at my house, the scooping goes to twice a day, every day!!! So, I here us my entry! I already get Cute's awesome email daily and I just liked Smart scoop on FB! Liking a self scooper on FB. Really liking it alot! With 4 kittehs, we scoop da poop a lot..seriously, this would help out a lot! Thx for the opportunity! I "liked" Stanley on Facebook - great! I'm following Stanley on Twitter, too! I have to scoop at least 4 times a day, and probably should a little more sometimes! Oh man! This is an awesome prize! With my 2 boys, it seems I'm scooping at least 4-5 times a day, and that's being lazy! This must be heaven sent for all of us fur-moms! I am already a big fan of Cute and am a daily email subscriber! AND....I just "liked" smartscoop on facebook! Whoo Hoo! Another chance to win! I just liked Smart scoop on facebook. I liked Smart Scoop on Facebook! The publicist is following Stan on twitter. I do not tweet. I am a goat, not a bird. The publicist liked the litter box on facebook. I do not have time for facebook. I have all of those weeds to eat. I am not lazy like the publicist and spend all my day on the computer. I do NOT scoop anycat's litter box but the publicist says she scoops once a day 'cause she has two boxes so maybe that's twice a day? I joined The Daily Cute Email list, liked Smart Scoop on facebook. I have 3 cats so scooping occurs as needed but normally once a day. Our mom has to scoop the boxes at least twice a day. Three times if we're feeling feisty!! Mom follows Stan on Twitter now. We're too busy messing up the litter box to bother with that tweeting business. We all follow Cute via email now too! Though Mom says she's got the most cute right here with us. She's right, of course. Last but not least, Mom said she "Liked" the SmartScoop page on FB. We really hope she wins this nifty new box!! I did everything you asked of my dear sweet Dorian. Mother to my BFF Pimp! Mother to the next President of the United States , Moo! Wow what a great contest! Well, with as many cats as I have I scoop a LOT of times a day - in many different boxes! I am going to say at least 14 times a day (7 boxes 2 x each minimum, depending on how much use they are getting!). One big cat who uses his box frequently - we scooop at least once a day and sometimes more frequently! We subscribe and grabbed your button for our website. Scooping is done once a day for each of the three boxes. More often if it's stinky poop day. I scoop at least two times a day with 4 kitties and 1 box :) I also "Liked" SmartScoop on Facebook. I have 2 cats, and clean the box probably 6-7 times during the day between the 2 cats. This would be wonderful! It seems like I'm always scooping. We have 9 cats / 8 litter boxes [yeah I know the formula, but I'd like one room w/out a litter box, lol] It keeps a girl busy! Yes I also scoop constantly we are staff to 10, it does keep us busy! I also subscribe to email, thanks!! I subscribe to the emails, and I clean the litter boxes (3) once a day! That's a lot of poop! My brother and I have two BIG litter boxes Papaw has to clean for us. We'd love to make it easier for him! We liked Smart Scoop on Face Book! Mom already subscribes to Your Daily Cute! I clean out my kitty's litter box twice daily, once in a.m before leaving for work and then at night - I dont use Twitter; I have already "liked" Your Daily Cute on Facebook; and I already subscribe to "Your Daily CUte" that's how I knew about the give-a-way. I'm not good at scooping, so this would be great! I am subscribed to Cute by email. We scoop 3 times a day! I like Smartscoop on Facebook. Subscribed to Cute by email. With 6 cats 4 litter boxes 3 or 4 visiting cats daily, I scoop at least 3 times daily. More on weekends. With 3 active boys this would really help! Always scooping after we just cleaned My Husband cleaned yesterday and of course they went right in after it was clean no waiting! I have one kitty & scoop once a day. I receive Cute by email. Thanks for the contest. This would be wonderful I have to scoop at least 2 to 3 times a day. Been subscribed to Cute for some time, love it!! With 3 cats, there's always something to scoop. Major scooping is done 3x a day, 1st thing in the morning, when I get home from work, and before bed. But if I go in the cat room and a present is there, gotta scoop it. I am a volunteer foster home for a local no kill rescue and I scoop more poop than you know. I usually have between 4 and 6 kittens at a time plus my own 2 wonder cats. what a dream it would be to have a little help! I scoop twice a day. My cats are "poop"snickerty!! I follow Smart Scoop Stan on Twitter. I like Smart Scoop on Facebook. I have subscribed to Cute.